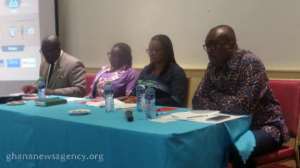 The Ghana Centre for Democratic Development (CDD - Ghana) maiden report on the implementation of the New Patriotic Party (NPP) Government's flagship Infrastructure for Poverty Eradication Programme (IPEP), indicates that the Government is on course. The IPEP programme-predicated on the Government's economic vision that systematically decentralising infrastructure development would spur economic growth, create jobs, and reduce poverty - would see government allocate one million dollars for each of the 275 constituencies in the country annually. Although significantly different in terms of structure and focus, IPEP does not depart too far from several other development initiatives over the years. Experience from the past and current development projects of such nature show that their management record is extremely poor - owing to the very nature of their stakeholder consultation processes, planning, design, and implementation - as they are often mismanaged, unaccountable, and lack transparency. To protect IPEP from false start, ensure transparency and accountability of its implementation, strengthen the framework and performance of the institutions set up to govern the program, as well ensure an efficient and good corporate management of the public funds allocated to IPEP, CDD-Ghana is implanting the project 'IPEP Tracker' to monitor implementation. Principally, this report forms part of the first phase of the CDD-Ghana IPEP Tracker project and focuses on the assessment and monitoring of the preliminary processes for the implementation of IPEP at the national, regional and district/constituency levels. The report is a culmination of the review of the NPP Election 2016 Manifesto, government policy statements, the new Development Authority (DA) Acts, and about 150 stakeholders and key informant interviews, including Ministers, coordinating and planning Directors, civil society organisations, media, political party executives, and representatives of traditional authorities at the national, regional, and district/constituency levels. Professor Henry Kwasi Prempeh, the Executive Director, CDD-Ghana, speaking at the maiden report launch of the IPEP, dubbed the 'One Million One Constituency Programme," said the project was being undertaken by the CDD-Ghana with funding from the DFID, under its Strengthening Action Against Corruption (STACC) programme. He said they do not want to do a post-mortem of this IPEP programme, adding that, 'rather than do a post-mortem, what we decided to do is, even before the moneys are disbursed, we decided that it would be important to get down to the field and find out what structures, processes and institutions we creating at the sub-national level to use the resources that are going to disbursed under this programme'. He said the amount of money involved in the programme was a significant infusion of money from the national capital budget to the local level; stating that 'how the money is used is a function of what processes has been created to really use the money'. He said findings from their research, would serve as feedback into the process now as the moneys were beginning to be disbursed to inform some modification. He said they were coming to this against the drop of the problems and failures with the erstwhile Savannah Accelerated Development Authority (SADA) and other development initiatives where moneys were injected ostensibly for the benefits of local communities but they really do not often times get there and when they get there they really do not have the intended effects. 'This is our little contribution based on that history to try to avert the same kinds of problems that we had with SADA and other development authorities,' he said. Mr Awal Mohammed, Research Officer and Team Leader for the IPEP, said the objectives of this project was to strengthen the framework and performance of institutions set up to govern the IPEP. He said the project seeks to eliminate corruption and misuse of public resources by ensuring transparency and accountability in allocation, disbursement, expenditure, accounting and auditing of public funds. Mr Joseph Dome Chognuru, Chief Director, Ministry of Special Development Initiatives, lauded CDD -Ghana for the report; stating that the Government would give it the needed attention. Professor Doe Tsikata, Head of Department, Institute of African Studies, University of Ghana, who chaired the function, hailed CDD - Ghana for performing a very important function of holding duties bearers accountable to the citizenry.